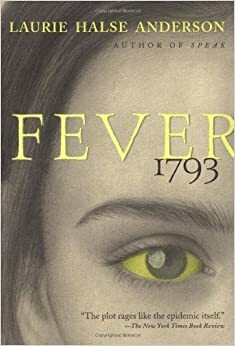 In 1793 the newly established United States was ravaged with a horrible fever, and not just any fever, it was the Yellow Fever. The book Fever by Laurie Halse Anderson, follows young Matilda Cook as she struggles through the epidemic. The story takes place in a coastside town in the nation’s first capital, Philadelphia. Matilda, or Mattie, as her mother calls her, lives above a coffee shop owned by her and her mother with help from their maids Polly and Eliza. Polly seems to be unusually late for her work one day and Mattie and her mother find that she will not be coming back at all, for she had contracted Yellow Fever and died. A few days later Mattie’s mom becomes ill and a doctor is called to check on her, and explains she only has a summer sickness. Eliza tells Mattie to take her grandfather and flee the city as fast as they can, for she believes that the doctor is wrong. Does Mattie’s mom indeed have Yellow Fever? Has her grandfather caught it too? Where will Eliza go?And what about her? Laurie Halse Anderson has created a wonderful cast of characters that many a person can relate to. In my opinion Maddie is the most relatable because she doesn’t always want to do what she is told. Her writing style has a way of keeping her readers on edge and constantly questioning what will happen next. Mattie Cook showed me that even if you are dressed in petticoats and skirts you can still save the day and find that, you will always find a way through impossible odds.